Summer is all about relaxation and casual events. The trends all shift with brisk fall weather. After the fun of the summer, many brides opt for more formal ceremonies for their fall nuptials. The trend toward formality is currently resurging after the spontaneous nature of the summer months in our area. Here are just a few of the trends that caterers in Cleveland feel are more common in the fall months. Formal invitations. Formal invitations set the stage for more formal ceremonies. Invitations that feature gold or silver lettering, reception cards and script let your guests know that your wedding will be special and elegant. Seated, plated dinners . For a more formal option, consider opting for a seated dinner rather than a buffet. The elegance of being served an aesthetically pleasing dinner will allow your guests to enjoy the feast you have designed for them. Use local, flavorful vegetables. In the fall, your Akron caterer can help acquire locally grown vegetables that will be the most flavorful of the season. Your guests will enjoy every bite when they have a chance to eat locally grown foods. Celebrate ancestry with foods. Your ethnicity is an important consideration when thinking through your menu. Choose meats with a chimichurri sauce, artisanal sausages or handmade pastas for a truly special meal. Luxe menu details. Adding in just a few luxe details can elevate your wedding above many others. Smoked salmon with caviar, truffle oil and delicate pastries are just a few of the ways you can add luxurious details in your foods. 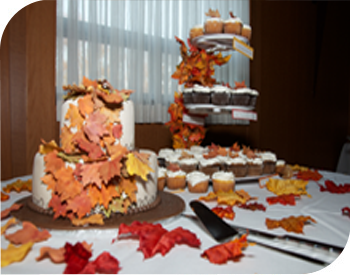 Fall is an amazing time to enjoy a more formal wedding celebration. With seated dinners, local vegetables and delectable menu details, each and every guest will remember your wedding forever. Call Special Moments Catering today for more formal wedding ideas.